Cindy Sawyer wants a horse. She asks her parents when she can have one so many times that they forbid her to ask any more. Pidgy's Surprise addresses a situation that plays out in most homes, whether the object of the child's longing is a horse or not. Kids will immediately identify with Cindy, knowing how it feels to want something so badly and to have parents who just don't seem to understand. 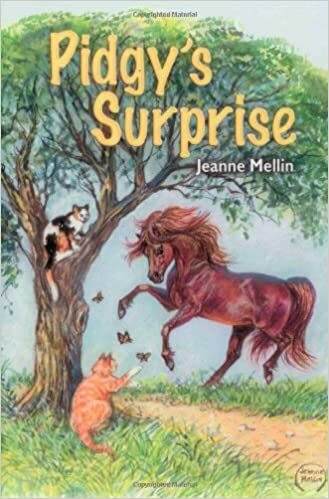 Author Jeanne Mellin allows young readers to think more deeply about the issues involved as they follow the story of Cindy and Pidgy, her Shetland pony. Cindy longs to be like her neighbors, older kids who win trophies at horse shows, riding graceful well-trained horses. She just wishes that Pidgy were not so fat and shaggy and that she would stop acting like a clown at the horse shows. Though Cindy may wish that her pony would look and act differently, readers will love everything about Pidgy from the moment they meet her. She is plucky, mischievous, and very devoted to Cindy. Animal lovers and their parents will quickly see that the relationship Cindy has with Pidgy is better than owning the most beautiful horse around. Cindy feels left out, however. The other kids ride their horses, preparing for horse shows, and Cindy can only watch. Kids will recognize these feelings from their own lives and understand Cindy's wanting desperately to fit in. Pidgy's Surprise is more than a story about wanting a horse; it is the story of a child who wants the admiration and acceptance of her peers. Pidgy's Surprise follows Cindy through a year of her life. Mellin weaves images of the changing landscape into the story. Her poetic descriptions of the light on the meadow, the weather, and the changing seasons mark the passage of time without interrupting the flow of the story. Adults will enjoy reading Pidgy's Surprise out loud to younger horse-enthusiasts. The language and the flow of the text complement the story, making it enjoyable for parents, as well as children. As the landscape makes subtle changes throughout the year, Cindy is changing, too, growing up. Cindy begins to realize that the girl who brags about winning trophies at horse shows is not someone she admires after all. She watches other kids with their horses and recognizes that the love the children have for their horses is more important than how well-trained and well-groomed the horse may be. Although Cindy still thinks about horses, she remembers to have fun with Pidgy the pony along the way. Throughout the year leading up to the Country Club Horse Show, the show where Cindy can compete with Pidgy, Cindy is defining for herself the qualities she values in other people, as well as those she values in animals. Young readers will gain perspective on their own lives, as they identify with Cindy's. The characters in Pidgy's Surprise will remind kids of the characters in their own schools or neighborhoods. Young readers will have a chance to reflect on the behaviors they, themselves, admire in others. Pidgy's Surprise was originally published in 1955. The setting will seem idyllic to today's parents. Cindy spends her free time outside, close to home, with neighbors and, of course, her pony. She might even inspire kids to spend more time outside-- or to start begging for a horse instead of video games! Will Cindy get what she really wants? She finds along the way that she already has more than she had realized. As the title of the book suggests, Pidgy the pony also has a surprise for her. Quill says: Animal lovers will enjoy the close relationship between a girl and her pony while learning to appreciate what they already have.